The town of Carr was established by the Union Pacific Railroad in 1872. Carr was named for Robert E. Carr of the Union Pacific, who managed the construction of the rail line through the town. The Carr Post Office opened on March 26, 1872. From 1920 until 1939, the town carried Old Colorado State Highway 5, which was meant as an access route. However, during this time, routes numbered 1-19 were major cross state highways, making it a somewhat useless route. Carr is located at 40°53′47″N 104°52′32″W﻿ / ﻿40.89639°N 104.87556°W﻿ / 40.89639; -104.87556 (40.896257,-104.875488). Just north of the Carr turnoff on I-25 is the Carr Natural Fort. It is a natural limestone formation where many noted Indian battles took place between the Crow and Blackfeet tribes. ^ a b Eichler, Geo. R. (1977). Colorado Place Names. 77-089726: Johnson Publishing Company. ^ "Carr". Atjeu Publishing. Retrieved 9 January 2013. ^ Bauer, William H.; James L. Ozment; John H. Willard (1990). Colorado Post Offices 1859-1989. 90-34759: The Colorado Railroad Museum. ISBN 0-918654-42-4. ^ "Carr - Colorado Ghost Town". www.ghosttowns.com. Retrieved 2018-04-02. 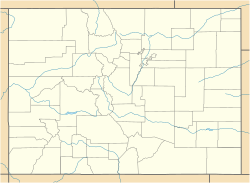 Wikimedia Commons has media related to Carr, Colorado. This page was last edited on 2 April 2018, at 12:11 (UTC).